Woe is me; 2013 was not my year. Lucky I'm sane after all I've been through. I kicked off the new year with shots of Jameson Whiskey. The night had so much fun potential, yet it went downhill fast. Brian and I were not getting along by the end of the night. Of all the years we've been dating, 2013 was definitely the hardest! The Valentine's Day card that I got for Brian remains in my car's glove box, unopened. Let's just say it was not a good day in the Strawberry household. Also, my grandma died on February 25th. 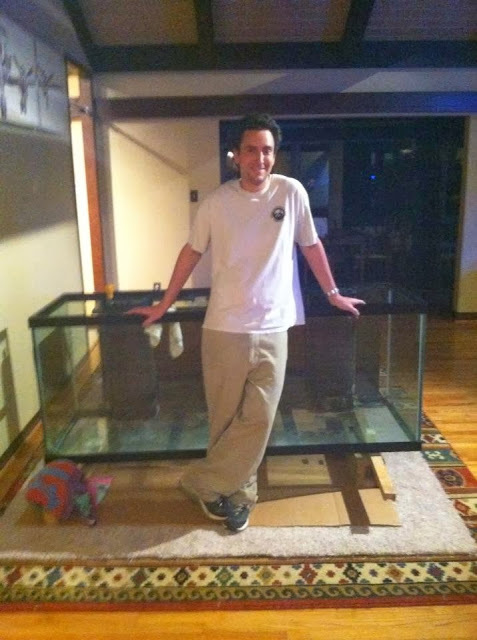 Brian sets up his new 240 gallon fish tank (i.e. this month was mostly characterized by Brian cursing in the living room and Kelly walking on eggshells). Needless to say, stress levels were high. While there's a few contributing factors, I lost the energy and motivation to do a lot of things. Basically, I let myself get into a funk and I'm just now starting to come out of it. My blogging suffered and so did my book club. I'm officially closer to age 30 than I am to age 20. There's a reason you shouldn't cut your own bangs. I'm sure something went wrong this month. I've probably blocked it from my memory. On top of a busy time at work, Brian began the carport project. Like most home projects, this turned out to be much more stressful than originally anticipated. I had a sore throat and swollen tonsils for a month. I also went to the dentist and found out I have six cavities forming. Yay. I had four trips to the doctor to try to remove a reoccurring mucocele in my mouth. It's basically a bump that comes and goes on a regular basis, usually when I'm eating. Every time I schedule an appointment to have it surgically removed, it disappears so that the doctor can't do the surgery. It may be a bourgeois crisis, but it's a crisis none the less! After five and a half hours of driving in the pouring rain, I was exhausted from a long day, but looking forward to our annual Christmas party with friends. I pull up to the party that night (chauffeuring Brian because I was the designated driver) and I ran my car into the curb. Brian opens the car door and all I hear is "pshhhhhhhhhhhhhhhhhhhhhhhhhh" (that's the sounds of air leaving a tire). I walked into the Christmas party and broke down crying. There were some good moments this year, but most of them got buried beneath the rubble. 2014, please be good to me!